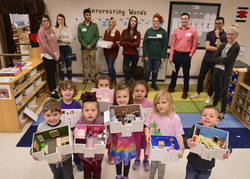 One group of Stephen F. Austin State University interior design students worked with children in prekindergarten in the Early Childhood Laboratory to create bedroom models to better understand how to design for children. Through this project, SFA students studied anthropometric data, which is the science of body measurements. 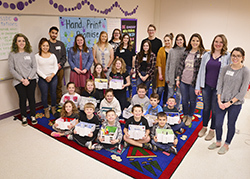 NACOGDOCHES, Texas - Through a partnership with the Early Childhood Laboratory, Stephen F. Austin State University interior design students worked with 5- and 6-year-olds in prekindergarten and after-school care to design bedrooms. SFA students were split into two groups, one worked with the prekindergarten students and the other with children in after-school care. The children served as the clients, and each SFA student was paired with a child to design a bedroom for him or her. Dr. Mitzi Perritt, SFA professor of interior design, explained that this experience introduced the SFA students in the course HMS 208: Creative Design Studio to model building, as well as the stages of the design process. The SFA students were tasked with interviewing the children, preparing sketches, designing floor plans and constructing 3D models. Unlike other design projects, this one required students to study anthropometric data, which is the science of body measurements. Students measured key dimensions on the child's body to ensure the furnishings would fit. Many of the bedroom models included natural lighting, accessible shelving, display areas for artwork and collections, private "hideaway" retreats, and accommodations for active play. After the models were built, SFA students presented them to the children. Many students said interacting with the children and building the structures were their favorite parts of the project. Stephen F. Austin State University interior design students worked with children enrolled in after-school care in the Early Childhood Laboratory to design bedrooms to the specifications of each child. The children acted as real-world clients, which enabled SFA students to learn model-building skills and experience the design process.